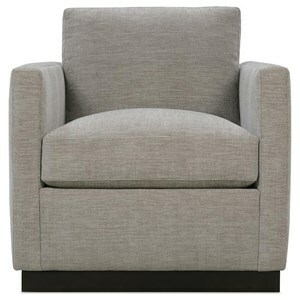 This transitional chair will give you a comfortable place to sit while adding simple style to your living room. Resting on tapered wooden feet and adorned with nailhead trim on the sides, this piece offers a sleek look to any space. The cushion seat and seat back feature welt cord trim. The Springfield Transitional Chair with Nailhead Trim by RB by Rowe at Belfort Furniture in the Washington DC, Northern Virginia, Maryland and Fairfax VA area. Product availability may vary. Contact us for the most current availability on this product. Wood & Finish Wood feet available in several finishes. See store for details. Frame Construction Engineered not to warp, twist, or split. Solid kiln-dried hardwoods and wood laminates, backed by a limited lifetime warranty. Joints are held solid with mortise and tenon or double-dowel and corner-block construction. Padding & Ergonomics Several cushion options available. See store for details.